Perlight Solar was established in 2006 as a subsidiary of the Baolite Group, a conglomerate of companies operating in a highly diversified range of industries including international trade, light manufacturing, business finance and solar power and renewable energy. Perlight headquarters and main production plants are located in China and are able to supply a combined capacity of 400 MW of solar cells and modules per year. International sales offices and warehouses are located in Shanghai, Germany and the UK. The company also has a commercial branch here in Australia, in Glen Iris, Victoria. Perlight supplies mono and polycrystalline solar panels with a power ranging between 5 and 320 Wp, meaning that they are suitable for a wide variety of residential and commercial applications. Moreover, their photovoltaic products are VDE, UL, MCS, ISO9001:2008, ISO14001:2004, IEC, TUV, CEC, FSEC, CE, ETL, and BPPT certified. 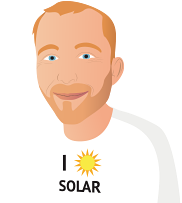 If you want to find out more about Perlight Solar’s range of products, take a look at the reviews here below from customers who bought their solar panels in the past and make sure you browse the solar products listed on this page to find the ones that best match your requirements and needs.